Explanation: What would it be like to see a sunset on Mars? To help find out, the robotic rover Spirit was deployed in 2005 to park and watch the Sun dip serenely below the distant lip of Gusev crater. Colors in the above image have been slightly exaggerated but would likely be apparent to a human explorer's eye. 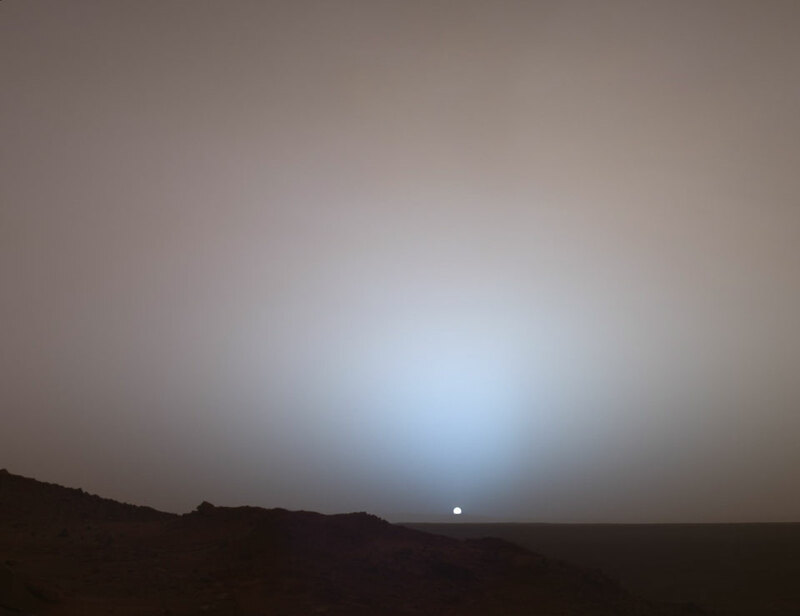 Fine martian dust particles suspended in the thin atmosphere lend the sky a reddish color, but the dust also scatters blue light in the forward direction, creating a bluish sky glow near the setting Sun. Because Mars is farther away, the Sun is less bright and only about two thirds the diameter it appears from Earth. Images like this help atmospheric scientists understand not only the atmosphere of Mars, but atmospheres across the Solar System, including our home Earth.